Every once in a while in my readings I stumble across a place I just have to see. That’s what happened when I was reading through a Clare County genealogy site on MIgenweb.net. There was a story by a man named Roy L. Dodge who was one of the premiere historians in the county about 50 years ago and wrote such books as Michigan Ghost Towns and Ticket to Hell: A Saga of Michigan Bad Boys, (I’m still looking to get a copy of the latter). Anyway, Mr. Dodge has written a story about a tombstone with a mirror created by Oliver Gosine. It’s a great story and I just had to find that tombstone since no photos accompanied the story. So one fall day, I trudged out to Harrison’s Maple Grove Cemetery and wandered the rows to photograph it. It wasn’t hard since the tombstone is a tall one. Sadly, as in Mr. Dodge’s time, there’s is not much left of the mirror. Vandals broke it years ago. I was tempted to install a new one since Oliver Gosine, the man who built the tombstone and hauled it to the cemetery, installed the mirror for a reason. So read on. And after you read Mr Dodge’s story below that can be found on Clare County Reminiscences, tell me what you think about installing a new mirror. Many gravestones, especially those more than 50 years old, bear epitaphs, fancy engravings, and were made in many unusual designs. 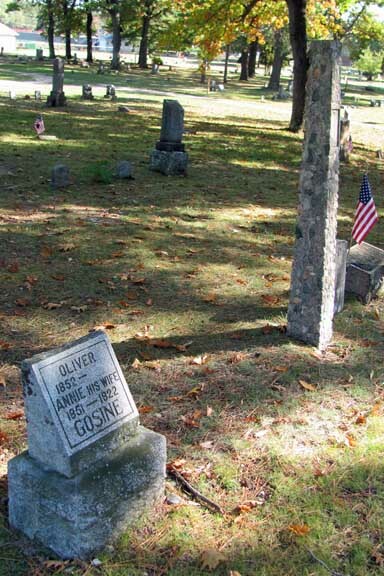 But, the seven-foot high tombstone of Oliver Gosine who made his own monument in 1925, and lived to be nearly 101 years old, is probably the only tombstone embellished with a plate glass mirror. “Who knows, but what I may want to come up and take a look at myself once in awhile?”, he said in answer to people who paused to watch him work during the two years it took to make it. Working in his spare time he selected stones about the size of a golf ball until he gathered enough to make the tall obelisk. While the cement was still wet he fastened a seven-by-nine inch beveled mirror on the stone at eye level. When the work was completed to his satisfaction, Gosine loaded the monument on a flat wheelbarrow and wheeled it a half mile to the cemetery near the North Harrison city limits and placed it on his grave-to-be. Gosine was one of the longest-lived of Harrison’s pioneers. Born in Montreal, of French descent, Gosine came to the Saginaw Valley when a young man to work in the lumber camps. “I took a train for a new town called Harrison where zey said I could find work. When I got off zee train, it was night.”, he said in his soft French accent. “I took only a few steps and fell head first into a pile of brush from trees cut to make a street”, he related in later years. Gosine, spelled Gatien in French, worked in lumber camps around Harrison until 1891 when the Wilson brothers made him foreman of the ice-cutting crew on Budd Lake. He was paid the then unbelievable wage of $4.00 a day, more than four times the prevailing rate at that time. After the logging days when most of the lumberjacks moved to the Upper Peninsula or to other states to work in the timber, Gosine stayed on in Harrison. In later years he worked as a handyman for businessmen and at one time, in the 1920’s, he had a fruit and vegetable stand near his home at the corner of present day US-27 and Main Street. When he was in his 90’s he would point proudly at the sixty-foot high maple trees along Main Street and say “I planted those trees when they were just leetle fellows”. 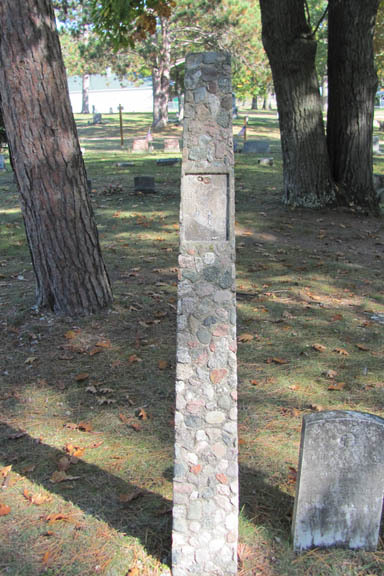 In 1927, two years after he completed his tombstone, Gosine and Oliver Beemer were interviewed by a news reporter from Detroit which resulted in the only published history of the logging days when Harrison was “The Toughest Town in Michigan” according to the resulting story. Photo copies of the full page story with photos of Gosine and Beemer, who were both the same age and in their 80’s at the time, hang in several bars and prominent places in Harrison today. Gosine always wore a long, handlebar mustache, of which he was very proud. He was small and wiry and had a great sense of humor. “When I die I want to be sure my hair and mustache are combed. Maybe I want to look at myself sometime”, he answered when people asked him why he put a mirror on his tombstone. He died in January of 1946, just short of his 101st birthday and is buried with the mirror. Several years ago the mirror was broken, probably by vandals, but enough remains to reflect the sun shining through the overhanging branches of a huge pine tree on a bright day. The tree was only a seedling when Gosine got off the train in Harrison. Very nice,Oliver Gosine was my great,great grandfather.Oliver Beemer,mentioned also in the newspaper interview was my great grandfather.Its good to know the old boys are appreciated by others. Do you have the book “Ticket to Hell. Michigan’s Bad Men” by Roy Dodge? The story also appears there. Other than it’s a great story I’m not sure why it appears since your great great grandpappy was not one of the badmen Dodge talks about. I also ran across a story in a 1946 copy of the Cleaver the other day that mentioned a Beemer. Not a nice story since it had to do with a car crash so I won’t go into details. I was in the Cleaver archives to learn about a fatal airplane crash that year at the Harrison airport. I found another great story about Oliver I will post soon. I found it in the book “At Ease with Col. Sharp.” The book is in the Harrison library and has a few chapters on Harrison history. Not sure where the story originated and I doubt if the Col. is still around. The story also mentions a Beemer who owned a store or bar in town around that period (1889) so it sounds like the Beemers have been fixtures around this area for a long time. Oliver Beemer owned a few bars in Harrison and Clare in his day.My Family moved here to work the lumber camps and seem to have gotten stuck here. have just aquired an original copy of the 1929 newspaper with the interview,,full page artical..All the oral history of Harrison,I mean all the names of people,Jim Carr information,22 salooons,on and on and on…came from this interview.Forrest Meek s info and everything pretty much started with this.Alot of information..I have a copy for you. Thanks, Cody. Looking forward to seeing it. I think I read: Ticket to Hell: A Saga of Michigan Bad Boys, about 20 years ago. Checked it out from the Farmington Hills Library branch on 12 Mile road. If it’s the right book, it talked about all the bad towns and people and how Michigan had more killings, robberies, bank and railroad heists than anywhere out West at the same time. Another good read was “My Six Months Amoung the Indians” by the editor of the Niles Michigan newpaper, I think. How as a young man he was very ill and the doctor sent him out to live in Indian country, North of Niles. It all took place about 1829-30, as I remember.